Watch this space for upcoming investigations - Please read the booking terms and conditions at the bottom of this page. 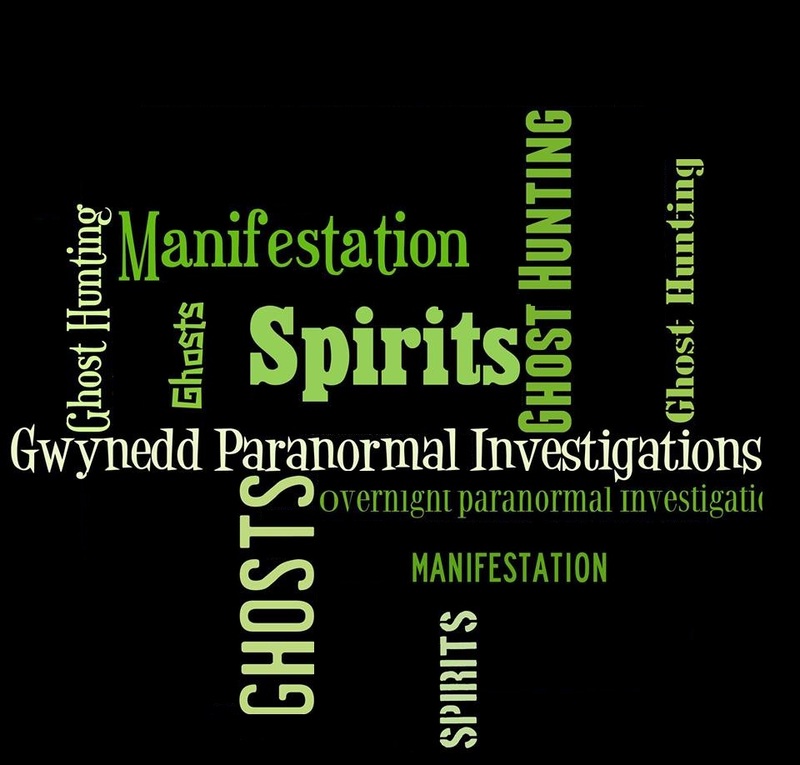 Be part of the team and be a paranormal investigator for a night of ghost hunting, in the quest for evidence of paranormal activity in reportedly, some of the most haunted buildings in Gwynedd and North Wales. Join us for a night that could possibly change your life forever as we go in search of evidence of life after death. We will investigate possible spirit activity such as knocking, cold breezes and dark shadows that cannot be explained. We will attempt glass divination and participate in table tipping experiments. We will also use some ghost hunting equipment including; beam barrier alarms, latest technology in EVP (Electronic Voice Phenomena) recording and more. Built in 1838 as the Ffestiniog Union Workhouse and enlarged in 1897 with the Victorian vagrants ward. This building included 6 sleeping cells where inmates slept on a wire bed with no mattress and work cells where inmates would smash rocks into small enough pieces to pass through holes in a metal sheet. At the back of the site is a separate 'cottage' which was previously used to house inmates with infectious diseases and more recently as nurses accommodation. There have been many stories of strange goings on at Bron Y Garth over the years and following a team visit of the site, we couldn't pass on the opportunity to investigate such an interesting building before redevelopment takes place! Cost of this event is £35 per person with deposit of £15 payable at time of booking. The balance is due by the end of February. This event is being organised on behalf of the residents of Barmouth. They are raising money to buy a much needed Defibrillator to be positioned on the estate at the end of the Promenade. There are many defibrillators dotted about the town but there isn't one near enough to the housing estate. The residents have already done an amazing job of raising almost the entire amount they need to buy the equipment so this is a little helping hand to raise the remaining balance! The cost of this event will be £30 per person. Bookings can be secured with a deposit of £15 with the balance being due at the end of February. 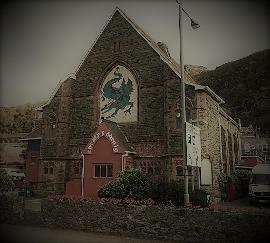 The imposing granite and slate building which houses the Dragon Theatre and Barmouth Community Centre was constructed in the 1890’s as an English congregational chapel. Previous investigations in this venue have proved to be very paranormally active indeed and our last investigation on Halloween last year was no exception! Price includes tea and coffee but does not include snacks. You are welcome to bring your own drinks and snacks. There have been many stories and sightings of strange apparitions in this building over the years and when you consider the land on which it sits, is of significant historical importance, it's no wonder it's so atmospheric! The imposing building (ca. 1886) of T.H. Roberts was a remarkably well preserved ironmonger's which still had its original fittings, until more recently when it became a tea room/Coffee shop. 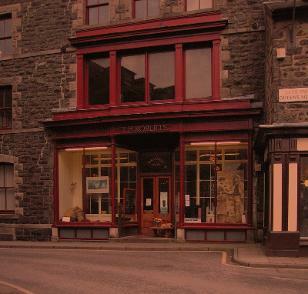 At the turn of the century over 500 gold miners were employed around Dolgellau; many of their picks and shovels must have come from here. A much older building, Cwrt Plas yn Dre, once stood on this exact site, and was reputedly a meeting place for the famous Welsh rebel Owain Glyndwr who temporarily controlled much of Wales in the early 1400s. Despite being the town's chief tourist attraction, the building was demolished in 1881 The cost of this event will be £35 per person. £15 deposit each at time of booking with the balance due at the end of March. 1) Booking Agreement: By booking an event, the participant(s) agree to all terms and conditions, the participant(s) indemnify Gwynedd Paranormal Investigations (here after referred to as GPI), from and against all liability in respect of any costs, claims, damages, demands, penalties, actions, proceedings, suits, losses or expenses in respect of or arising out of the injury to or the death of any person, or damage to any property arising from participation in the activity. It is also recommended that you take out third party liability cover prior to the event. 2) Health and Safety aspects of the event must be adhered to at all times. GPI will not be responsible for any physical, psychological and long term illness or injuries, or death as a result from attending any event. Investigating the uncharted world of the paranormal can be hazardous and dangerous so all clients attend at their own risk. Attendees must stay with their group at all times and not take it upon themselves to wonder off. GPI will have done a thorough Risk Assessment prior to the event; therefore there may be certain areas which are cordoned off for the safety of the attendees. Anybody who does not follow these rules will be asked to leave. 3) No person under the age of 18 is permitted to attend any of our events due to our insurance terms. 4) We do not advise any pregnant woman to attend our events, this is out of interest for the safety of yourself and your unborn child. Accidents can happen in the dark and GPI will not be held responsible for any accidents that may occur. 5) We do not discriminate against anyone with a disability however, due to most of our events having unsuitable access for wheel chairs it may not be possible or safe to attend certain investigations. If you have a disability and would like to join us, please contact GPI and we will advise on the best possible options. 6) We have a zero tolerance of illegal drugs and alcohol. Anyone found to be under the influence of either will be asked to leave immediately with no refund. If you have been prescribed any medicines by your doctor you must inform GPI staff before any investigation. 7) We cannot guarantee that you will see or experience any paranormal activity on any of our events but if you do, we suggest you try to stay as calm as possible for your own safety and the safety of people around you. 8) Smoking is not permitted inside any of our locations, there will be a designated smoking area outside and away form the building. 9) GPI will not be liable for any loss or damage to equipment belonging to the participants during and after the event, even if caused by poltergeist activity. If in doubt keep your belongings with you. 10) In the event of an investigation being cancelled, you will be made aware of this by the contact details you have given. If this happens we will transfer your booking to the next available investigation. If an event is postponed, your payment will transfer to the new date. If you are unable or unwilling to attend on the new date, you are welcome to cancel your place. Should you cancel your place; more than 30 days before the event, you will receive 50% refund. If less than 30 days, no refund will be given. 11) Investigations are carried out at night and generally in the dark until the early hours of the morning. If you have far to travel we would advise you to book a local bed & breakfast or hotel; driving whilst tired can kill. 12) GPI will not be held responsible for any damage caused by guests during our investigation. 13) We advise all guests to only bring with them the equipment and money you need for the event. We suggest you don't bring handbags and anything that can be, must be left in your car or a safe place. You will only need a camera and a maximum of £5 for 6 strips of raffle tickets. ONLY BRING THE MONEY THAT YOU NEED. All bags must be left in the base room during the investigation for safety reasons. 14) No food or drink is permitted out side of the base room, during the walk around or after investigating has begun. This is for the respect of the property we are using and to prevent damage. Some of the buildings we visit and their contents are of historical importance and usually of great value. 15) Mobile phone policy - Due to an increase in mobile phone use for so called 'spirit APPS', use as torches and cameras, the decision to ban ALL mobile phones has been taken! Phones must be left in the base room during investigations! An emergency phone number will be given for anyone who may need to contact you during the night. This is because; mobile phone signals interfere greatly with some of the equipment we use. The use of mobile phone lights for torches has become distracting and problematic and 'spirit apps' are not scientifically proven to be accurate and therefore we do not allow them on our events. WE ADVISE YOU TO BRING YOUR OWN TORCH AND ALSO A CAMERA/CAMCORDER IF YOU WISH TO TAKE PHOTOS OR VIDEO. If mobile phones are seen to be used during vigils, you will be asked to return it to the base room. Continued use will result in you being asked to leave the investigation. 16) By signing these terms and conditions, you are giving your permission for all photographs or video records made on any GPI investigation to be used by GPI and/or being published on the GPI web site. 17) These terms and conditions are non negotiable. Each guest will be required to sign a copy of the terms and conditions to show that you hereby agree to abide by them. 18) GPI reserve the right to change, add or amend these terms and conditions at any time. We also reserve the right to change, add or amend any part of any event at any time.